There have never been more options for safely backing up your images so if your work is valuable to you, there is no excuse for not backing it up. The list goes on and on. Funnily enough, the same level of subjectivity applies to digital workflows and back up strategies. The bottom line is everyone's workflow and back up strategy is different. There is no and never will been one process to fit all. The paranoid among us will deem a RAID 5 set up essential while the more daring (although perhaps fool-hardy) photographer will have only a single external hard-drive. With this much variety in such a seemingly simple concept, why should I bother sharing my strategy with you? Well, if you are like me, you've probably already read through two or three of these sorts of articles already, realised you're going to have to come up with your own solution but want to get a feel for how other photographers ensuring their images are safe. Before I came up with my current process I had a look at what others recommended, picked out the good, practical points that suited my time, budget and technological constraints and then rolled my own back up solution. Although planning then implementing your own back up strategy can be time consuming (at least to begin with), it may also be subject to change in a matter of years as new technology becomes more mainstream. For example, the falling prices of solid state drives (SSDs) makes it tempting to replace standard hard disk drives with these faster, more reliable drives but has the down-side of having to copy large amounts of data (say goodbye to your weekend). Once your strategy is set up and you are happy your files are safe, you should be able to forget about it - at least the day to day operation. You should be confident you know where you could get a backed up copy of your data should the worst happen. If not, familiarise yourself with the workflow until you are. At the heart of my workflow is my main editing machine, an iMac. Inside is a 240GB SSD and a 500GB HDD. I removed the CD drive myself in favour of a secondary hard drive. On the SSD lives my operating system and all my apps (e.g. Lightroom, Photoshop etc). All my images reside on the 500GB hard drive in my machine - yep this manages to store all my images thus far. Hang on! Why have all the images on a drive that's difficult to access? If there's a fire in my house, I'm not going to be legging it out the door having with my iMac under my arm! Well my Mac is of an age where it only has USB 2 ports and therefore, having my image library housed on an external HDD means editing images in Lightroom would be hideously slow and a performance sacrifice that I'm not prepared to live with. So I have them stored on one of the drives within the iMac to keep the access speed high. As a redundancy I have two external HDDs to look after backing up. One of them is a mirror of the internal HDD and easily accessible. This drive is synced automatically every 2-3 days using back up software. The second drive receives a copy of every single image I import to Lightroom. This is automated in the Lightroom import dialogue box. Not only does this mean I have a third copy of my images but even if I remove an image from my Lightroom catalog that I later want to get back, it will be on this drive. This drive is also easily accessible in case I need to grab it. Furthermore, I have a third external HDD that I use in conjunction with Time Machine to periodically sync my Mac's SSD to. This is only done once a week or so meaning I can re-instate my operating system and all my apps from one of these back ups. Lastly, I have my back up software set to copy my Lightroom catalog to various drives and cloud destinations. My thinking is that you can separate your images, Lightroom catalog and Lightroom application quite happily as long as you have a back up of each. I don't want to put all my image files in the cloud - it would take too long and could be very expensive so I'll use hard drives for that. My Lightroom catalog however, can be backed up to both the cloud and my external drives and the Lightroom app itself is based on Adobe's Photography subscription so in a disaster scenario, I can just download it again. Based on this separation, my biggest point of vulnerability is still the hard drives. Fire or theft are still an issue but one that can easily be remedied by removing one of the drives to another location. I use Carbon Copy Cloner by Bombich, to schedule my back ups. It's a paid piece of software but it's intuitive, easy to use and has some great features like being able to wake your computer to perform back up tasks. This software would easily pay for itself 10 times over if I ever lost a hard drive. Of course, there are other options available to perform these tasks but investing in a solid system is a very good idea. Cloud storage is a fairly new way of keeping your data backed up. Almost everyone I know uses it in some form or another. For example, mobile phones routinely back up photos to cloud storage so if your phones dies, your photos are safe. For photographers there are a range of options. Some of the best known are Dropbox, One Drive and Google Drive. They offer large amounts of storage for fairly low prices, you can move data in and out for free and there are usually nice user interfaces for interacting with your objects. Of course, image files can be quite large (several megabytes) so depending on how heavily you wish to use this type of storage, the cost could mount up. Don't forget to factor in the time it takes to send all these files into the cloud - you'll probably want a decent fibre broadband internet connection! Although I don't back up my images to the cloud, I do use my Google Drive on a daily basis to sync files between all my devices and I find it incredibly useful. One alternative is to the mainstream cloud storage providers is Amazon. They offer various cloud storage options using a 'pay for usage' model with no minimum fees. While their standard Simple Storage Service (S3) pricing is comparable with Google's, they have a another product called Glacier designed for long term archiving that requires infrequent access. 100GBs of storage can cost as little as £0.40 per month and is a very cost-effective way of maintaining a secure archive of your images. Above all, make sure you have a strategy, any strategy! It took me a few months to come up with any kind of safety net for my images when I started my photography; firstly because I didn't value my work that much and secondly; I thought the chances of losing images was small. Now, having had multiple hardware failures the thought of losing images makes my blood run cold! 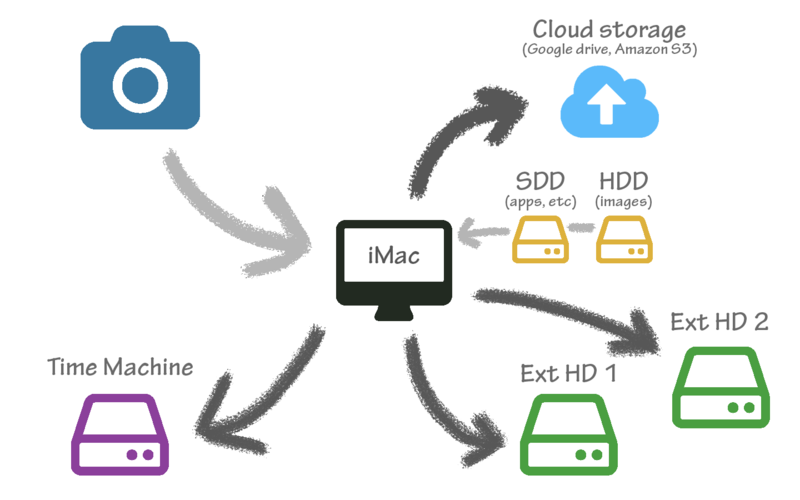 Overall, it doesn't matter how you make back ups of your images as long as you actually do it! Storage is cheap and plentiful and some of the images you make could be the result of hours of work and research making them fairly valuable so make sure you take care of them.